The median asking rents for rental homes throughout the country advertised on Trade Me Property rose by 7.1% last year, but there were big differences in different parts of the country. In Auckland, the country's biggest rental market by far, the median rent was up just 3% for the year, and in the month of December the median weekly rent was $510, which was down $10 a week compared to November. Christchurch remains a renters' market and asking rents in December were down 5% compared to a year earlier, while in the whole of Canterbury the median rent was down 2.5% for the year. Trade Me said asking rents in Christchurch had been stagnant for around 18 months and December's median asking rent of $399 a week was still well below the peak of $495 achieved in March 2015. "Unlike Auckland and Wellington, Christchurch tenants are in the box seat. Rents are barely moving and there are plenty of options in the market," Trade Me's Head of Property Nigel Jeffries said. Of the major centres, the Wellington region posted the biggest gain in rents, where they were up 9.8% in December compared to a year earlier. The biggest gain in median rent for the year occurred in Marlborough were they were were up 23% in December compared to a year earlier. The biggest decline was in Gisborne, where the median rent in December was down 11.5% compared to December 2015. The chart below shows how much median asking rents throughout the country have changed in December compared to December 2015. "Then there are my friends who have hardly ever paid a dollar of tax in their lives, but own a few houses and live well. Their secret? They buy a house do it up and either sell it after a couple of years or gear up and buy another, living off the mortgage in the meantime. They hate TOP’s tax rebellion..."
This is expected as based on supply vs demand. The people that claim that the rent prices (add: in Auckland) will be increasing due to the interest rate increases are rather unaware as to how a free market works. Hint: most of the current rentals available are investors focused on capital gain as opposed to a sustainable return. Rent values are determined on the margins, and are driven by the supply of rentals as compared to the demand at the current price. There are always a few that can pay whatever the market demands but the are many that cannot. Waikato and bay of plenty still showing substantial gains. common THE MAN what is really happening in Christchurch you said its on the up? Christchurch is the only city winning at the housing game - quality up (lots of new post-earthquake builds) and prices and rent down. The only way that can happen is if rents in Auckland have gone up by more than 7.1%. Why are Auckland rents listed as being up by only 3.0% ? A bit of research (consulting the Oracle of google) gets me some various data points. This shows that Auckland rent values as measured by the rent values that are recorded in the bonds lodged are indeed lagging behind the NZ national rent increases. One issue with the Trademe data is that it is the median *asking rent* as defined by the trademe rental advertisements. If the rental adverts for Auckland on Trademe doubled in number as compared to a year ago, the data as shown in the graphic could be correct. It is also instructive to look at the data for median vs average rent values. See: https://www.tenancy.govt.nz/rent-bond-and-bills/market-rent/difference-b... for some more information. Well spotted it doesn't make mathematical sense, and not a single "thumbs up"
Greg, can you please explain how rents in NZ excluding Auckland is 5.4% and when you add Auckland's rent increase of 3.0% we have a total of 7.1% for the whole of NZ ? Asking rents, what has happened to the Tenancy tribunal actual rent series. That's odd. I was hearing that rents would go up because interest rates were going up. Musta been misinformed. $10 a week? Ok it has to be the end of the housing market without any doubt, forget February find the nearest bridge or alternatively pitch a tent as no one is going to buy a house to live in. Sure. The only 3 options are a) live under a bridge; b) pitch a tent or c) buy a house. Spoken like a real estate agent. You understand this whole article is about rents right? Right now, at these price points, it's getting easier to argue that you're better off renting than buying. Median rent buys diddly squat. Rents usually drop when property prices drop and guess what; they are dropping. Yes, agree - that's kinda my point. Either prices need to drop to align with rents or incomes need to increase. It's how the long term system works. At the moment the rent is so much lower than the servicing of a loan and house prices are too extreme in terms of multiples of HH income. Interesting.Auckland and Christchurch. 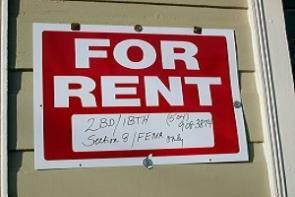 Housing prices and rents both dropping. Time to take some property and debt off both markets. And with mortgage rates and housing stock levels rising this could be just the beginning. Sharetrader, Christchurch is on the up, no doubt about it. The rebuild has been pretty slow but there is plenty going on now. The quality of life for Christchurch people who had to endure the earthquakes is first class now, with new buildings popping up everywhere, new housing and people who came in for the new build, now deciding to make Chch their home as they love it here. There definitely is an oversupply of rentals in Chch due to all the new houses that have been built and the damaged homes now repaired. Rents have dropped probably by $20 to $40 per week if you need to fi d new tenants but renewing tenants are happy to pay the existing amount they have been paying. Overall it hasn't effected seasoned landlords who are on the whole slightly better off with the lower amounts of interest they are paying on their mortgages due to the lower interest rates. There are great opportunities in Christchurch currently due to the altered LVRs from the Bank effecting first home buyers and some new investors. You admit there is an oversupply of rentals in Christchurch and that rents are down $20 to $40 per week and then say Christchurch is on the up. Then you say existing tenants are not moving when rentals are cheaper elsewhere. Are you serious? Well I suppose one has to deny reality because if you admit the truth it might upset one. Sure as hell if rents ar falling that much it is no wonder house prices are dropping in Auckland and Christchurch. Investors have to be dropping their offers as rents drop. Gordon, of course there is an oversupply as there have been thousands of new houses built in new subdivisions that have been opened up since the quakes as well,as,all,the repaired homes. Chch is having new commercial buildings built because of the future popularity,of Chch. Our tenants are more than happy,to renew as we provide warm and well maintained property so why would they want to leave for the sake of finding something cheaper but not as good? A drop of $20 or do is bugger all Gordon if the investors returns are good and just means we don't pay quite as much tax on the profit at the end of the year. It certainly isn't doom and gloom down here Gordon, quite the opposite as investors aren't competing with as many people for good property. You need to open your eyes a bit more Gordon and not be so negative. Remember my offer is still on the table! Rubbish, Chch is in the doldrums. There's a massive oversupply of houses, that's why rent is falling big time for the last 2 years, I know I lived there for 20 years and I still own 1 rental in Chch I just sold the other one in November. It's simple supply and demand, after the EQ rents went through the roof because a big amount of houses were inhabitable (lack of supply) now that most of the residential rebuild is complete there is a large oversupply of houses. The house I sold was rented at $500pw, I could not renew the rent at $400pw. Yvil, it is probably a good thing that you did leave Chch if you get depressed when you are in Chch. For the sake of your health we wouldn't want you that way, and Chch doesn't need depressed people living here. Not sure where your house you wouldn't be able to get $400 is, but we are still getting $450 plus for 3 bedrooms and upto 595 for 4 bedrooms with 2 bedrooms around $380 no problem. We could rent anything out at anytime but you have to be very careful with tenant selection as there are some that let's say you wouldn't want them as tenants for a variety of reasons. Rather have empty than have nilllers! No wonder house prices are so cheap in Christchurch and are dropping in value as your rents are so low down there. Not so sure tenants would view saving $20 to $40 dollars a week as being bugger all. Gordon, I keep telling you that there is value in Chch but you don't listen. Most tenants are not going to up and leave for a saving of $20 when they are in a well maintained property owned by professional landlords. I am pleased that you think that our rents are reasonable and they give us an excellent positive return forour efforts. Gordon most tenants would not move to save $20-40 in week. Given the landlord is happy to have the tenants stay on, one would assume they have been paying their rent, and hence can afford said amount. So in Gordon world, a family would up sticks from a settled environment, in a house they can afford to rent to get a rent reduction of $20-40 per week. Risking a bad landlord who does not maintain the property, or a landlord who decides to put the property on the market, or dodgy neighbours in the new property. Not to mention the cost of moving and the hassle of switching over services. If it was the 1970s or the 1980s you would be right, but not in the twenty teens. You are wrong. A lot of tenants would shift for savings of $40 a week. For them it is a lot of money as many are on low incomes. For those who are saving for a house that is $2000 a year. There is nothing to stop the existing landlord putting their house on the market. There are no guarantees whichever way they go. where did your friend move to? I know a few who have moved their too - definitely a nice place to live. In regards to Auckland commuting - I'm curious if it will be such a problem in the future. It will take a mind shift for employers, but with internet speeds nationally and internationally improving, I wonder if we will see a lot more people work from home - the types of jobs where that is possible of course. I am an Auckland to Christchurch mover. I am currently building a house to way above NZ standards at the base of the Ports Hills, decent garden, decile 9 school nearby, 10 mins commute for half the median price of my old Auckland suburb. Pay is the same although job openings are fewer. I keep meting move people everyday who are making the same move. Typically families with young kids. Balanced journalism at its finest. Ahem. Well maybe not. it's all about generating clicks - what does a rental spike mean anyway? $10, $20, $30 extra per week for a couple of weeks?